Welcome to Pearl Famous Academy of Skate and Sword, where the blades are sharp and the competition is fierce. Peasprout Chen dreams of becoming a legend of wu liu, the deadly and beautiful art of martial arts figure skating. 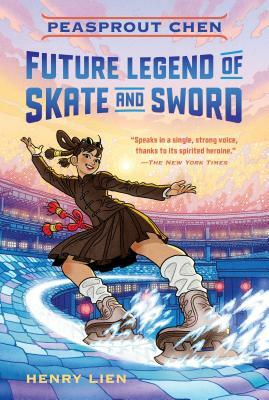 As the first students from the rural country of Shin to attend Pearl Famous Academy of Skate and Sword, Peasprout and her little brother Cricket have some pretty big skates to fill. They soon find themselves in a heated competition for top ranking. Tensions rise when the dazzling pearl buildings of the Academy are vandalized and outsider Peasprout is blamed for the attacks by her rivals ... and even some friends. Now, she must uncover the true vandal to ensure peace between Shin and Pearl – all while becoming a champion. Henry Lien is a 2012 graduate of Clarion West, and his short fiction has appeared in publications like Asimov’s, earning several Nebula Award nominations. Born in Taiwan, Henry currently lives in Hollywood, California. He is the author of Peasprout Chen, Future Legend of Skate and Sword. Other events and informaton HERE!